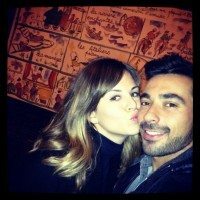 Argentine soccer player Ezequiel Lavezzi who is also a winger with Paris saint Germain, has been dating the beautiful model Yanina Screpante for quite some time, is about her that we are going to talk to you about. Lavezzi born in Villa Gobernador Galvez in Argentina wears the #22 with Paris saint Germain, g his team since July, 2012, before moving to France Lavezzi played with Napoli of the Italian Serie A. He made his international debut with the National team against Chile on April 18, 2007. Ezequiel’s girlfriend is the stunning Argentine model Yanina Screpante, 30, they have been dating since August, 2010. Screpante a well-known model in Argentina since she was 17, juggled her college studies as an Interior designer with her career while she was still living in Argentina, but she left all behind her when she decided to follow her soccer stud in Italy, well, she actually continue modeling, but there was comeback to college. Yanina dated Argentine tennis player Juan Martin del Potro before she hooked up with Lavezzi, after her breakup from del Potro, she was committed not to date an athlete ever again, luckily she changed her mind. Yanina and Ezequiel’s eight-year-old son Tomas from a previous relationship are practically best pals. 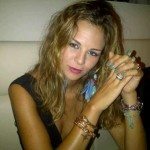 You can follow Yanina on Twitter here.